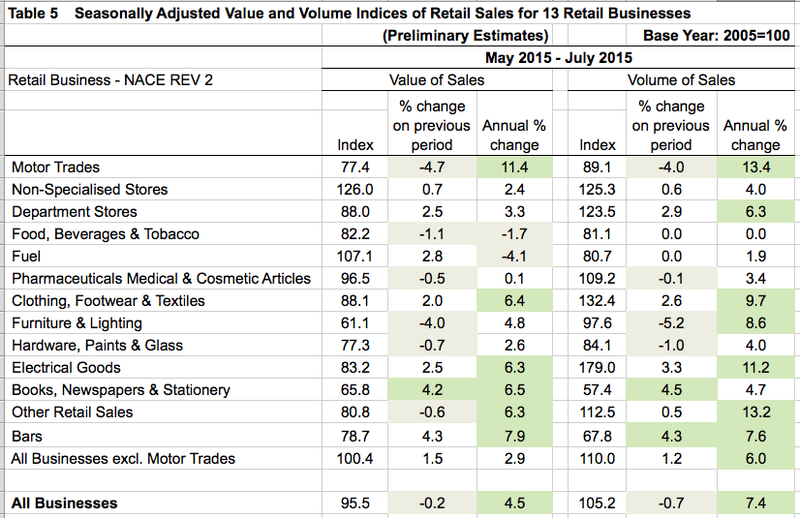 With much of hullabaloo around it, the Retail Sales figures for July were published today. The CSO headline on the matter read: "Retail Sales Volume increased by 11.6% in July 2015". Which is, of course, correct... to a point. The figure references sales inclusive of automotive sales. And it references volumes of sales. So here are the actual retail sales figures, for retail sales excluding motors. 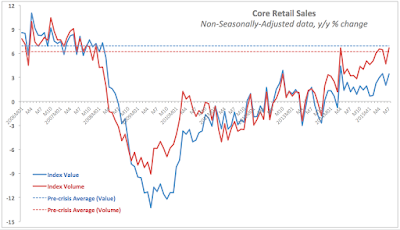 Value of core (ex-motors) retail sales increased 0.3% m/m in July and this only partially (albeit substantially) corrects for 0.3% decline m/m in June. Compared to 2005 average level, value of sales today is only 1.09% higher, which is... before inflation is factored in. 3mo MA of Value indices in July was down 0.03% on 3mo MA average through June, while a month ago the same was 0.7% higher. In other words, there is nothing 'convincing' in the value of sales data. And this is concerning, because retailers don't get their revenues and profits from volumes of sales. They get them from value of sales. Volume of retail sales (ex-motors) was up 0.64% m/m in July, having previously posted a decline of 0.12% in June. 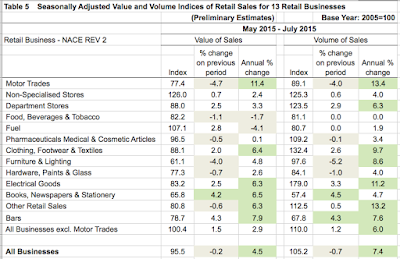 So July volumes of sales significantly over-compensated for June decline. Which is good news. Compared to 2005 average, July figure is 12.1% higher for the volume of sales, which means that deflation has resulted in more sales by volume, but barely any change in value: selling more stuff but getting less per unit sold is the retailers' margin nightmare and it has been going on for some years now. But the good news on Volume run out when you consider 3mo MA: 3mo MA through July was down 0.12% compared to 3mo MA through June, having previously been up 0.7%. So on 3mo MA basis (smoothing a bit volatility) value and volume of retail sales both fell in July. 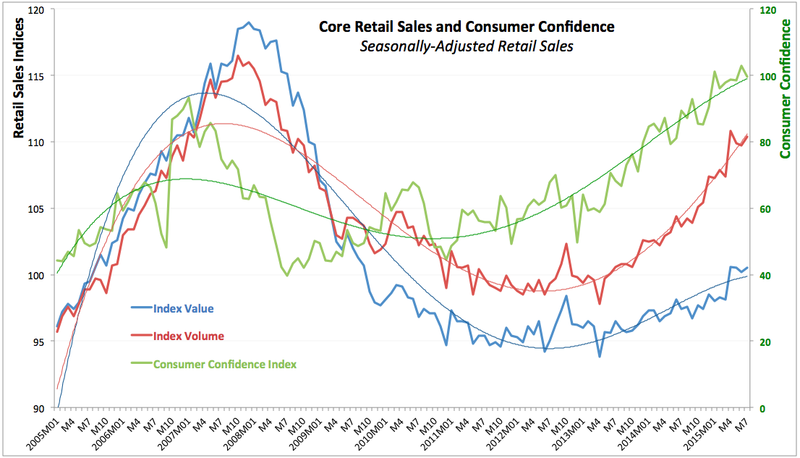 Value of core retail sales rose 3.40% y/y - which is a good performance, but not exactly stellar. In June, y/y increase was 2.0% and in July 2014 y/y rise was 1.2% which means this July growth was stronger. However, pre-crisis average y/y growth rate in Value of retail sales was 6.93% and this means that current rate of increase is just under 1/2 the rate of average rise in pre-crisis years. Smoothing out some volatility, 3mo average through July was 99.3 which is stronger than 3mo average through April 2015 (93.6) and is up 3% on 3mo average through July 2014. These are good figures, no arguing there. Volume of retail sales, predictably, was up 6.7% y/y in July - double the rate of growth in Value of sales and above the pre-crisis average rate of growth of 6.2%. Volume of sales gained in July in annual rate of growth compared to June (4.7%) and compared to July 2014 (3.2%). And on 3mo average basis, the index was up 6% y/y for 3mo through July - double the rate of growth in Value. 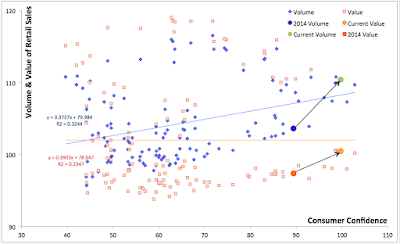 Hence, overall we have the same picture in unadjusted data: rates of growth in Value of sales are healthy, but not spectacular, while rates of growth in Volume are strong. 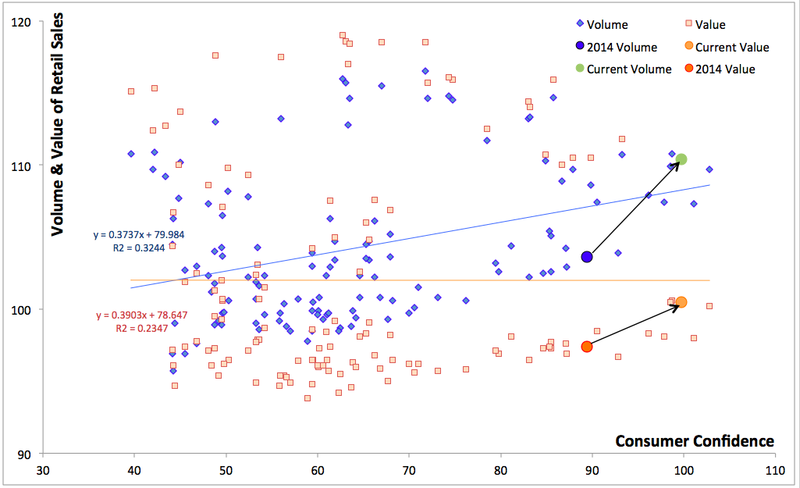 Volume is diverging from Value and there is nothing new here - it has been thus since the end of 2013. The picture was a bit more fragmented for 3mo change through July compared to 3mo change through April, as shown in the table below. 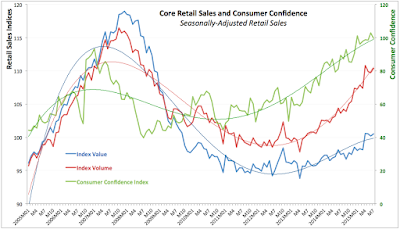 Thus, overall, there are some good news in the retail sales figures. Do they warrant a huge wave of congratulatory backslapping exercises in the media? No. Do they warrant much of optimism that the sector is experiencing a big revival? Not exactly.